Warning: Once a product has been deleted, it cannot be restored. 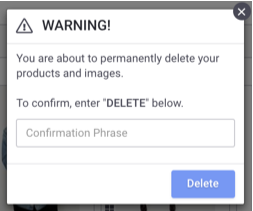 Please be sure you want to delete a product before doing so. Alternatively, you can set a product's status to "Inactive," which will automatically hide the product and it will not count against your Active product limit. If the product is in an Order, you will need to set it to Inactive instead of deleting. For more information on Active and Inactive products, see this article. Products can only be deleted from a Master Showroom, you will not be able to delete a product in a Sub-Showroom. On the Products page, toggle Tile View. 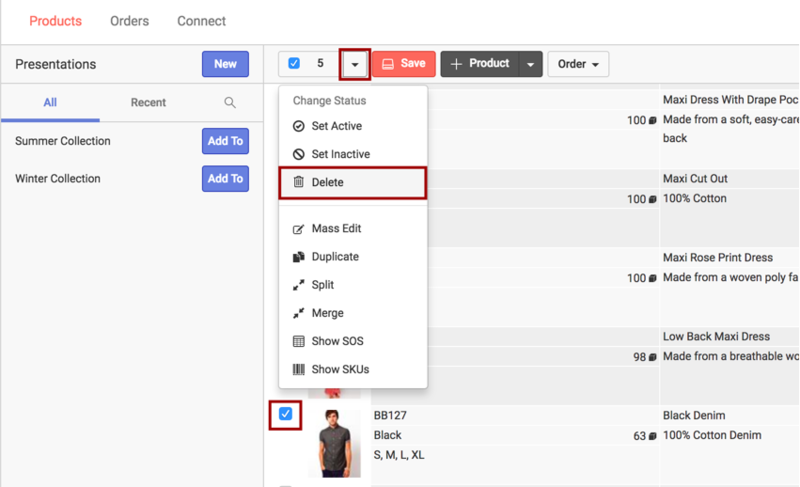 3) Click the product status pull down and select "Delete" from the menu. 4) A window will pop up and prompt you to confirm the deletion. Type in the phrase (case sensitive) and click the Delete button. On the Products page, toggle List View.